More than 51,000 students are enrolled in Kentucky’s private colleges, and another 213,000 in Kentucky’s many state and public institutions. To support an even broader range of students, some schools are getting creative to bolster enrollment, including favoring need-based financial aid packages and growing online education offerings, meaning increased higher education accessibility to students around the nation. So which of Kentucky’s online colleges and universities offer a best-in-class experience for online students? Find the answer to this and other frequently asked questions about earning a college degree online in Kentucky below. The University of Kentucky is the state's largest university and the flagship of its public university system. UK offers a substantial number of fully online and hybrid degrees and certificates through its UK Online program. Fields of study include agriculture, communications, education, engineering, fine arts, nursing, physical therapy and social work, among many others. Students can also find 17 graduate-level certificate programs offered. Non-resident students taking only online courses during the spring and fall semesters pay the same tuition rates as Kentucky residents. Nearly 40 degrees and certificates can be earned through distance learning at Morehead State University. A wide range of study fields is offered, including education, business administration and health care. Rank 1 programs in career & technical education and educational technology are also available. Programs of note include a Master of Arts in sport management and a nursing BSN post-licensure program. Most MSU distance-learning programs can be completed fully online, although some bachelor's degree programs are presented in a 2+2 degree-completion format requiring students to have completed their non-major coursework prior to beginning their online studies. Murray State University offers a wide range of online learning options, including 8 bachelor's degrees, 15 master's degrees, 2 certificates and 3 teaching endorsements. 2 doctoral degrees and a general studies associate degree are also available. Fields of study include agriculture, business administration, education, information systems, nursing, public administration and many others. Degree and certificate completion times vary by program, but students should expect to devote a minimum of 6 to 8 hours per week participating in the online learning environment. The University of Louisville's Online Learning program offers 9 bachelor's and 10 master's degrees, as well as 6 certificates and 3 teaching endorsements, all of which feature coursework that can be completed 100% online. Fields of study include communications, computer science, criminal justice, education, engineering, social work and many more. Length of time required to complete a UL online degree, certificate or endorsement varies by program, but many bachelor's degrees can be completed in as little as 2 years, and some master's programs require as little as 3 semesters. Active-duty military are eligible for tuition discount rates, and tuition assistance is available for both active military and veterans. Bellarmine University offers online master's programs in Education, Higher Education Leadership and Social Justice, and Health Science (Health Promotion and Social Change track or the Healthcare Leadership track). Educators can also choose Rank 1 post-master's programs to enhance their career prospects. Students complete courses in Moodle and follow the typical semester schedule. Small classes of no more than 25 students highlight the interaction among peers and professors. Online student services include academic and tech support, library and learning resources, and any other services available to on-campus students. Online options abound at Northern Kentucky University, including programs in business, healthcare, nursing and sociology. Full bachelor's degrees require 120 hours, but might be completed in less than four years, depending upon a student's chosen schedule. Many master's programs require between 30 and 38 credit hours, leading to completion in as little as one year. Multiple start dates and 7-week terms add even more flexibility. Student services offer assistance with advising, tutoring and more, and the Veterans Resource Station helps ensure those who have served can enjoy a streamlined online experience. Students at Eastern Kentucky University can choose from online degrees in dozens of fields, including some more unique options, such as those in police studies, social intelligence, veterans studies and fire science. Six start dates throughout the year allow for more flexibility, while eight-week courses through the Blackboard learning platform help build a quick, solid educational foundation. Online tutoring and robust resources, as well as dedicated student advisors, round out the assistance offered to distance learners. With over 100 online degree options, Western Kentucky University covers almost every academic field at the bachelor's and master's degree levels, as well as both undergraduate and graduate certificates. Award-winning online support includes online math and writing labs, tutoring, presentation and success coaching, and much more. This robust support helps students through the rigorous accelerated courses that allow for scheduling flexibility and completion of degree programs in anywhere from two to three years, depending upon the degree level and previous credits brought to WKU. Through the Office of Adult and Professional Studies at Ashbury University, students can complete their bachelor's degree in education, business, ministry or social work. The fully online programs offer start dates in August, October, January or March. Courses are delivered in an eight-week accelerated format. A generous transfer credit policy helps ensure prior learning is applied to the degree completion, helping students complete their program in two years or less. Set tuition rates plus many scholarship options help bring college within reach for online learners. Undergraduate students at Lindsey Wilson College can opt for online degrees in business administration, criminal justice, human services and counseling, and nursing (RN to BSN), while graduate students can choose the MBA, counseling and human development or Teacher as Leader programs. Accelerated, eight-week courses allow for flexibility, and the time to completion can be shortened with the application of generous prior learning credits. LWC Online is one of the many reasons Lindsey Wilson College is considered a military-friendly school. How can I find which online colleges offer the degree I’m looking for in Kentucky? If you already know your area of focus, the best way to check which colleges offer your desired program is to get online. The Kentucky Council on Postsecondary Education offers an academic program inventory that displays which licensed and accredited programs students can enter. Many institutions also list their programs online, such as Northern Kentucky University. If you’re not sure what you’d like to study, many online colleges in Kentucky offer a broad selection of bachelor’s, master’s, post-master’s and certificate program options online, including Western Kentucky University. Colleges and universities with a wide array of programs may be ideal for students who do not yet know which major to pursue. Which online schools in Kentucky will accept my transfer credits or work/life experience? Accredited colleges and universities in Kentucky generally allow students to transfer credits. However, some courses that transfer to one institution might not transfer to another, so you should contact the school that interests you to find out exactly which credits are accepted, and what the regulations on those credits may be. EXAMPLE: The University of the Cumberlands lets you transfer credits earned at most regionally accredited colleges within the past five years, however, these credits cannot count toward your grade point average. The Kentucky Community and Technical College System allows students to see how the credits they earn at any of the system’s ten institutions will transfer to any of the state’s public universities through the KnowHow2Transfer database. In addition, some schools award students course credit for their professional, life, and work experiences. This can be done through a portfolio assessment and various knowledge tests and exams. EXAMPLE: if you attend the University of Louisville’s competency-based education program, you may earn as many as 48 credits for professional development, work experience, or military service to use towards a full degree. How Much More Do College Grads in Kentucky Make? Kentucky residents who take on roles requiring a master’s degree could earn $38,000 more each year than their counterparts without a formal education. Positions for doctoral degree holders pay $73,000 more per year, which is 2.5 times more than jobs that require only a high school diploma. With every level up in education, careers in Kentucky pay more. Students in Kentucky continue to look for more flexible methods of earning their college education, and as online universities offer more programs to meet the demand, it’s fair to wonder how well educational quality standards are maintained. It’s true, not all online schools in Kentucky offer the same level of quality curriculum and student support. This is why looking for colleges with accreditation is important. The Southern Association of Colleges and Schools is the regional accrediting body for Kentucky’s online colleges. Regulations are based on six core values: educational integrity, continuous quality improvement, peer review, accountability, student learning and transparency. Schools who do not meet their standards on each value will not have their accreditation status renewed. 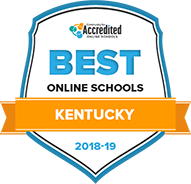 Besides holding regional accreditation, many online schools in Kentucky also choose to hold accreditation for specific programs that they offer. For example, Northern Kentucky University’s business college holds accreditation from the Association to Advance Collegiate Schools of Business. The business school offers an online business administration bachelor’s degree program with various concentration options. Some online colleges in Kentucky may charge online students the same rate as their in-state students, while others reserve more expensive rates for out-of-state students, both online or on-campus. To counter hefty tuition costs for non-residents, check out the Academic Common Market, where students can pay discounted tuition rates at particular schools in Kentucky and 14 other member states. If you are a resident of these member states, it makes tuition more affordable at more than 1,900 undergraduate or graduate programs, many of which are offered online. What are Kentucky’s requirements to qualify for in-state university tuition? In Kentucky, students generally need to live in the state for a year before they qualify for in-state tuition. In addition, they must demonstrate that they intend to remain in the state permanently. However, students may appeal to the council responsible for final residency decisions for universities and colleges: the Council on Postsecondary Education. Are online credits more affordable in Kentucky than other places? Your state of residency could make a major difference when answering this question. For example at the University of Louisville, in-state students pay $11,000 and out-of-state students pay $26,000 for tuition and fees. This is below average for in-state tuition costs at public universities, but much higher than average for out-of-state students. For undergraduate students in Kentucky versus other nearby states, here are current tuition costs per credit for 2018-2019 distance learning programs. Keep in mind, this does not include additional fees, which vary from school to school. How can I get help paying for online college in Kentucky? Students who plan to attend college in Kentucky might need assistance beyond the federal aid assessed by their FAFSA. While there are loans offered by the federal government, you can also take advantage of scholarship and grant opportunities available to learners studying online in Kentucky. Gill-Elliott Scholarship: Students graduating from Highlands High School who plan to study education, business, pre-medicine, engineering, math, or the biological or physical sciences may qualify. The scholarship, available through the Blue Grass Community Foundation, offers $2,000 to students. Kentucky College Access Program Grant: Students in Kentucky in financial need can take advantage of this grant if they plan to attend an eligible private or public institution. The grant offers $1,900. McConnell Scholarship: This scholarship goes to 10 seniors in high school planning to attend college. Scholarship payouts usually include a book stipend and full tuition, a paid trip to the District of Columbia, and a study abroad experience lasting five weeks in China. Students qualify for this scholarship if they hold at least a 3.5 GPA. In Kentucky, adult education programs predominantly serve aspiring students between the ages of 25 and 44 years old. To find a local adult education campus visit the State of Kentucky’s program directory.